We often hear about the need for reducing carbon dioxide (CO2) emissions caused by carbon-based fuels in our cars. 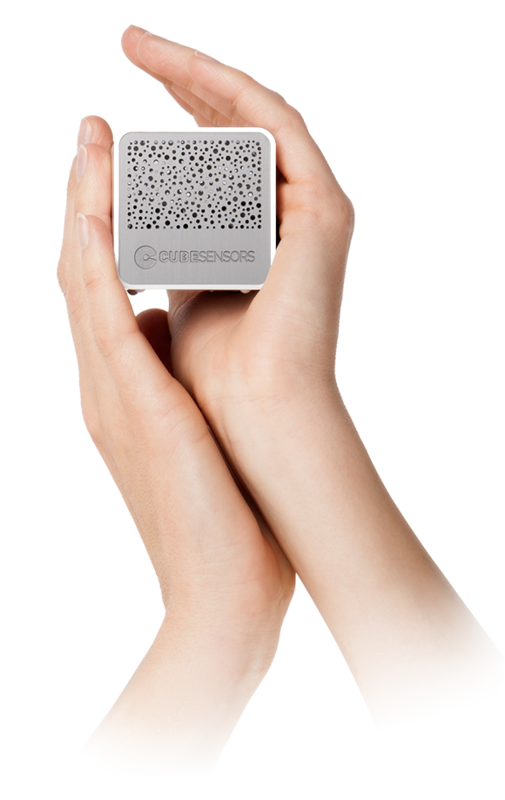 But what do CO2 measurements mean for the quality of the air we breath in our homes and offices? Let’s take a look! As you probably know, all living things exhale CO2 when breathing. The more people you have in a small room for longer periods of time, the higher levels of CO2 you’re going to get. That is why CO2 measurements can be used to determine whether a building has appropriate ventilation. Or, to put it simply, if there’s enough fresh air coming inside to keep everyone happy. If you can keep CO2 levels below 1000 ppm, it means the ventilation is just right for the size and occupation of the room. Getting fresh air in is important to dilute various contaminants in the indoor environment. This includes various smells and gases emitted by the building itself, the room’s furniture, equipment and various activities such as cooking, cleaning etc. And while high CO2 levels can tell you when your rooms aren’t getting enough fresh air, high CO2 levels alone don’t cause discomfort, bad smells and health problems such as headaches that we feel when the air “gets bad”. We might experience these symptoms when CO2 levels increase, but the real cause is hidden in the build up of contaminants caused by insufficient ventilation. Here’s where measuring Volatile Organic Compounds (VOCs) comes in. VOCs are gases that are emitted in the air we breath from different materials. According to EPA, the concentration of many VOCs is consistently up to 10x higher indoors than outdoors. We can detect some VOCs by smell (the new car smell is a good example), so measuring VOCs is more like actually smelling a room with a highly sensitive nose. 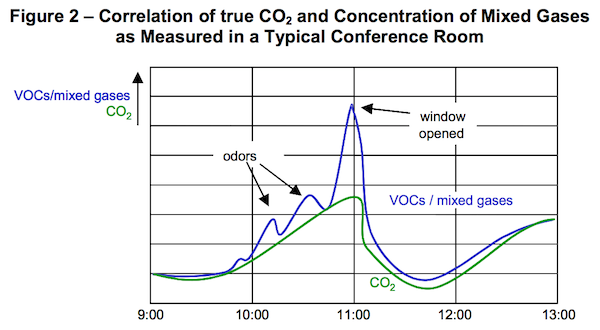 In contrast, CO2 is odorless, which means that CO2 measurements don’t tell you if a room smells bad. On top of being linked to odors, VOCs are also a good measurement of indoor air pollution. Some harmful VOCs can cause both short- and long-term health problems. Headaches, irritated eyes, nose and throat, nausea are just a few examples of symptoms that can be caused by high concentrations of VOCs. Long-term effects of VOCs have also been linked with internal organ damage and even cancer in both animals and humans. The disturbing part is that these problems can take their sweet time to develop if you’re not careful about their presence in your home and workplace. If that alone doesn’t convince you of the benefits of monitoring indoor air quality, there’s also the cost saving benefit. Keeping a sensor on VOC levels in buildings can lower energy costs (and get rid of bad smells faster) by ventilating rooms only when it’s really needed. 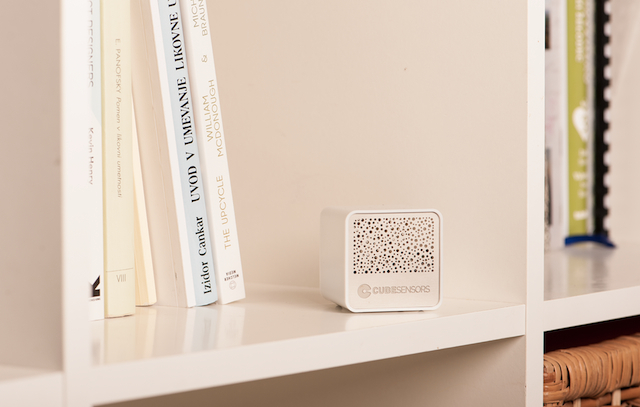 That is also why our CubeSensors are uniquely equipped to measure your air quality with a VOC sensor. By keeping track of VOC levels in your home or office, the Cubes can alert you of that tuna sandwich decomposing in the trash can, help you make healthier choices when it comes to cleaning products, encourage you to open the windows to prevent headaches or a restless night, and more.